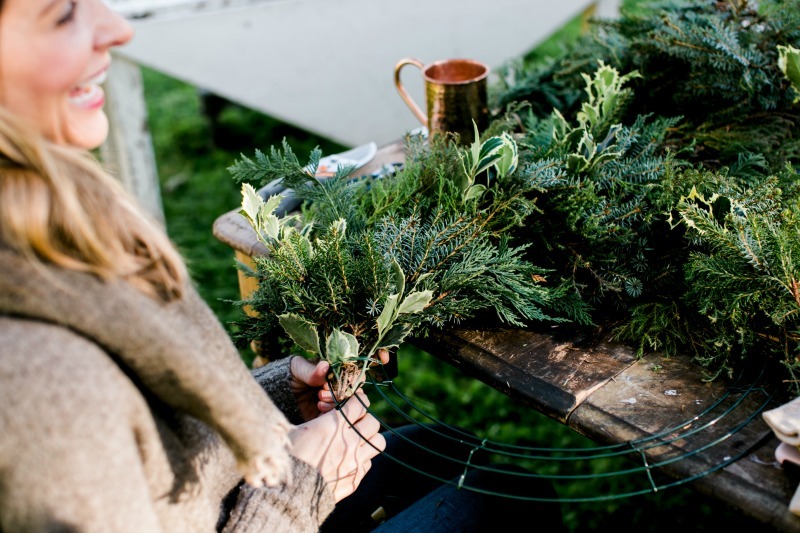 The smell of fresh evergreens always reminds me of Christmas. 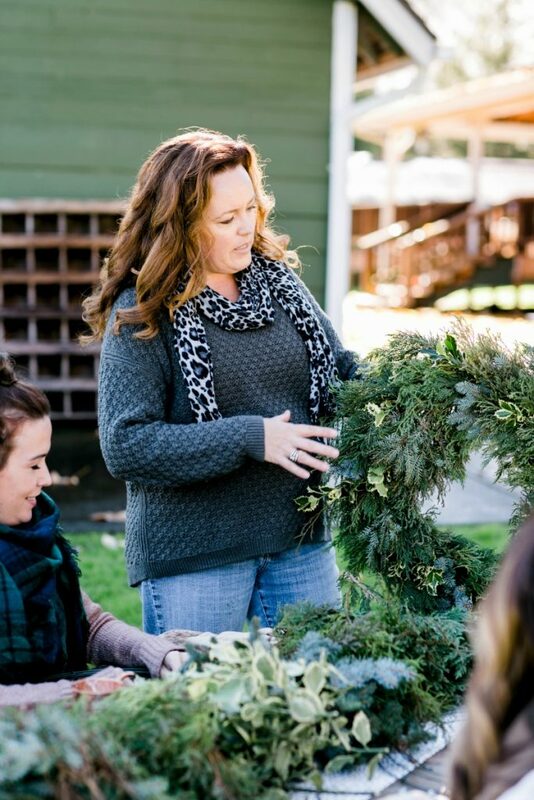 I make evergreen wreaths every year to decorate my home for the holidays. 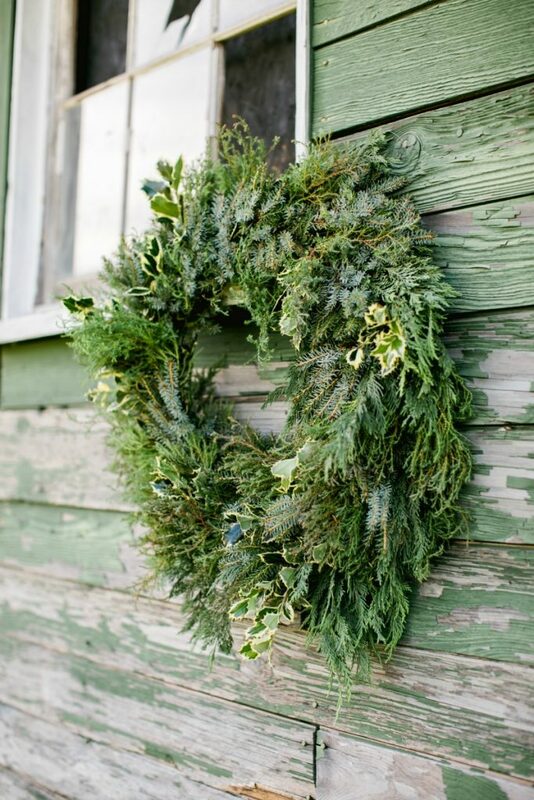 A simple DIY project to do, with just a few supplies needed from the craft store and greens from your yard. 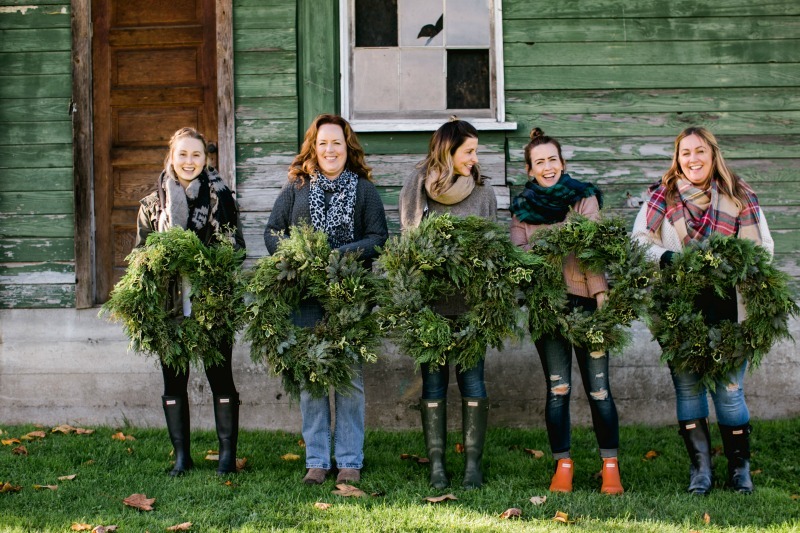 Gather some friends to make wreaths with you, just like Jenny Cookies did for her Wreath Making Ladies Lunch held at her home in the Seattle area. 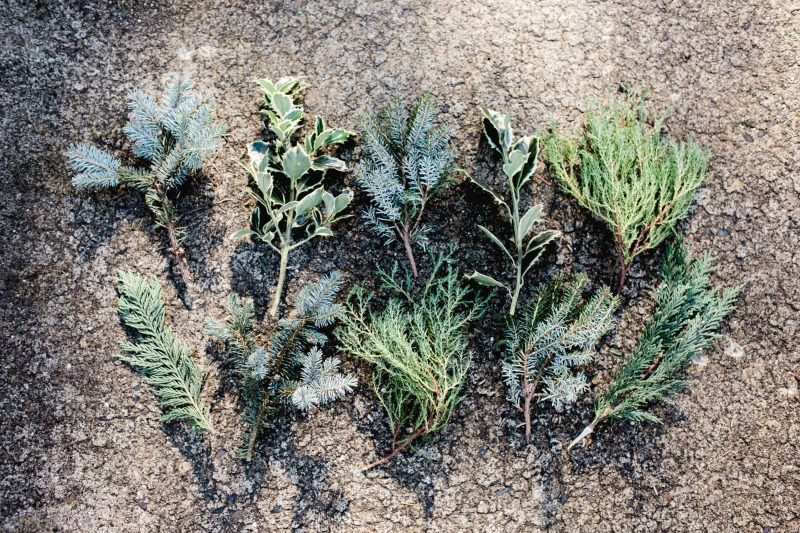 For the evergreens, I clipped an assortment from my yard. Many of the “foundation” plants used in landscaping are evergreen bushes and trees, so you probably have some in your yard as well. I chose: cedar, juniper, spruce, pine and holly. 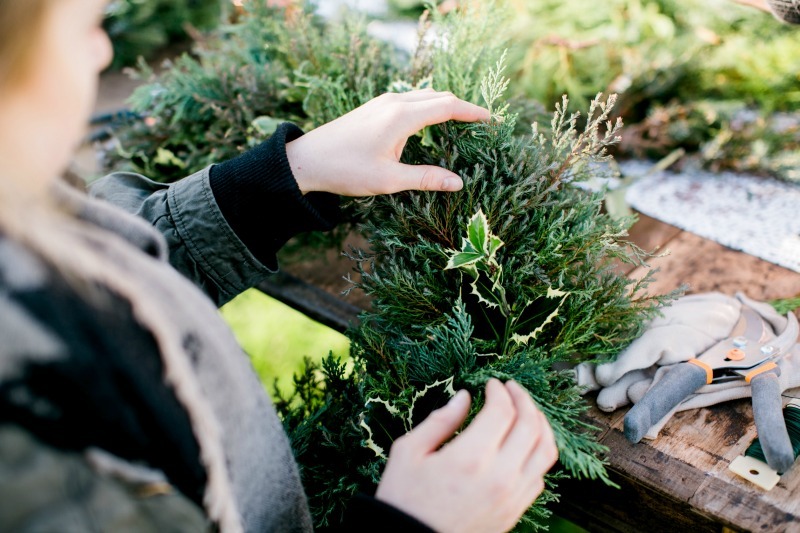 When clipping your evergreens, make sure you move around the tree and take from various places. 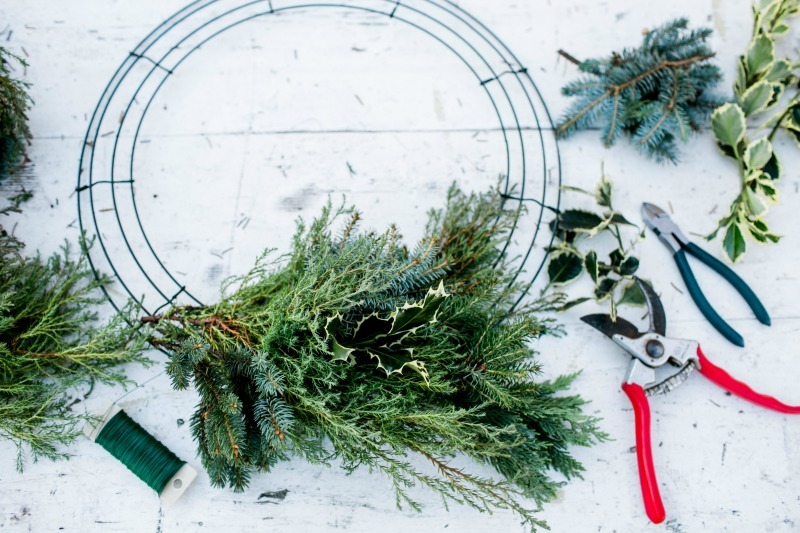 You don’t want to leave a hole in your tree by taking all the stems from one spot! Each stem should be 6-8″ long. 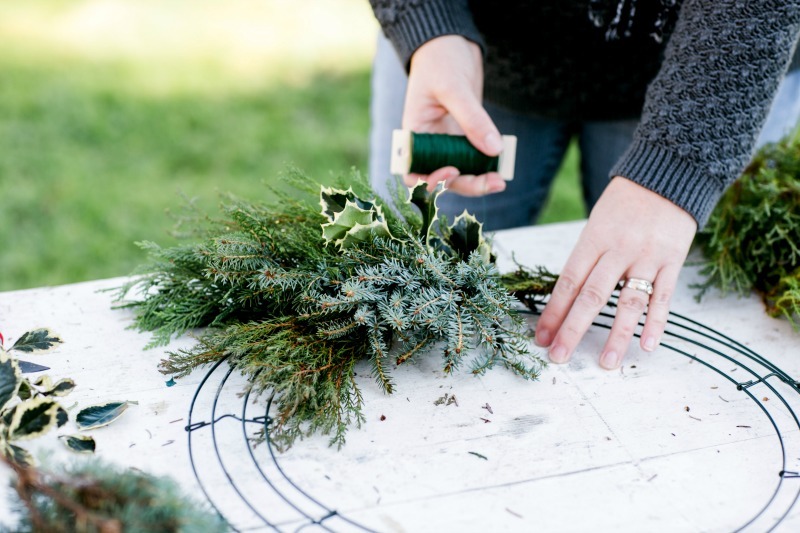 You will need about 100 stems to complete a 18″ wreath frame. Set up your work table so you have lots of space and easy access to all the stems. 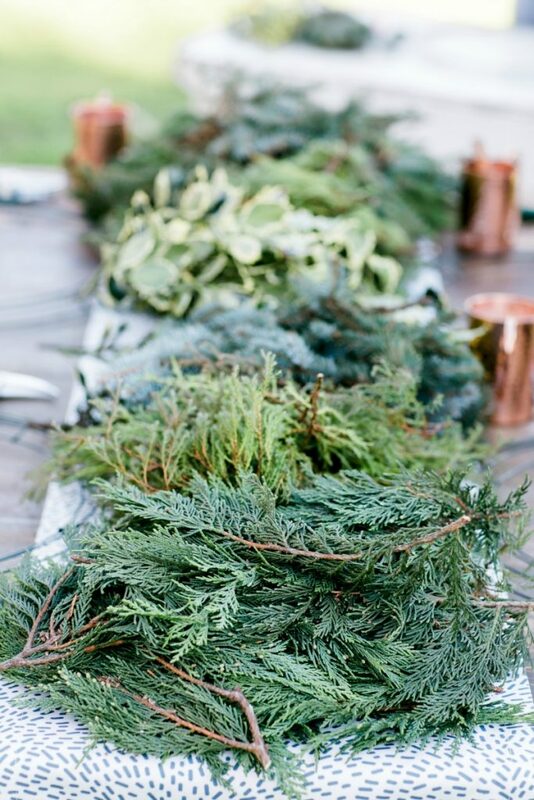 I like to work with piles of each evergreen variety within reach. The table was set for Jenny and her friends this way and it worked great. Now that you are set-up, its time to get to work. 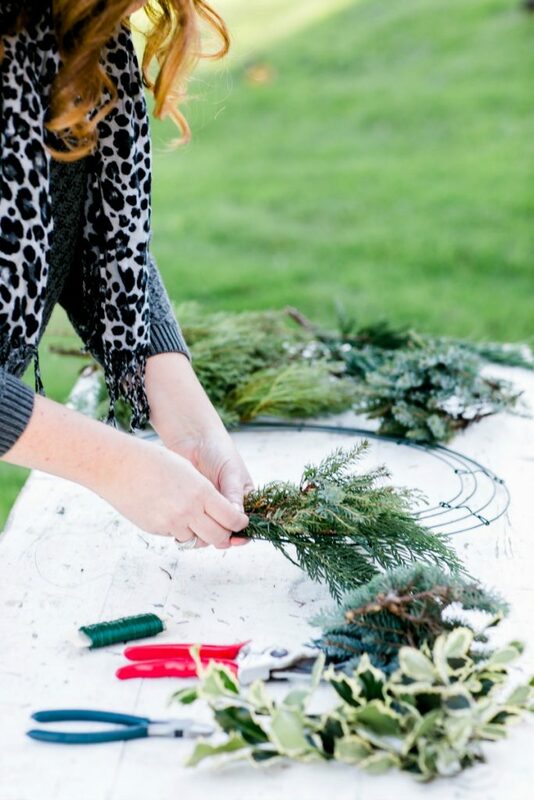 Start by anchoring your wire to the wreath frame. Do this by looping the wire around one portion of the frame, bending the wire back. Then twist the wire onto itself, so it is secure. You will be pulling the wire tightly when attaching the stems to the frame, so make sure the wire is secure. 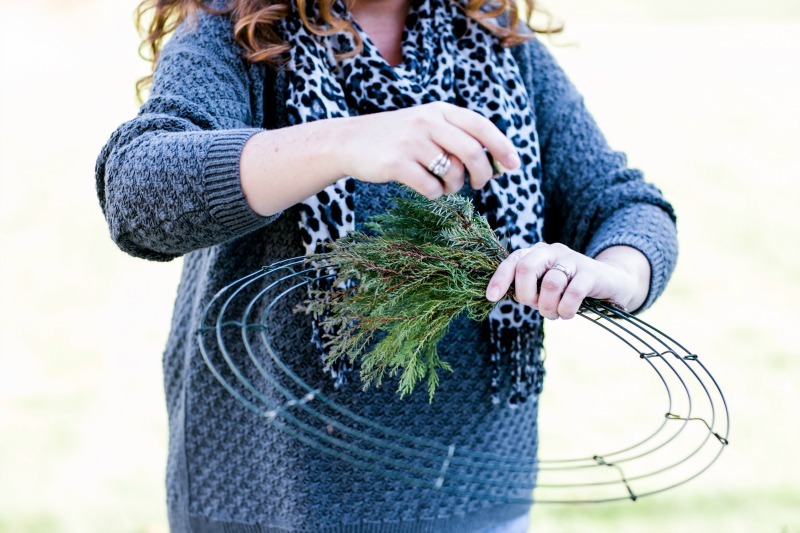 Lay 3 stems of evergreens side-by-side across the frame, so the wire you just anchored is by the stem bottoms. Holding the stems in place with one hand, start wrapping the wire paddle tightly around the frame at the base of the stems. It should only take 3-4 turns to make the stems become secure. Add 3 more stems across the frame, so the tops of these stems cover the bottoms of the first row of stems. How much space you put between each row is up to you. The main goal is to cover the bottom of the stems and the wire that is holding them in place. 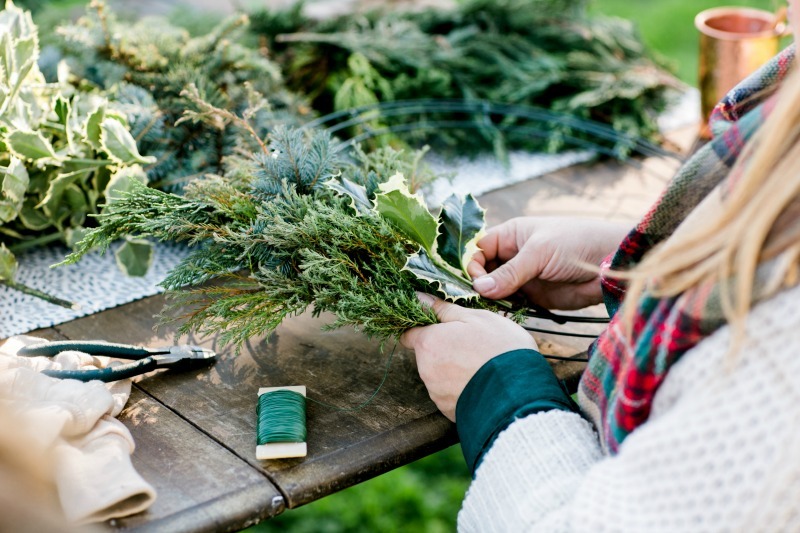 Hold the stems in place with one hand and wrap the wire around the frame again with the other hand. 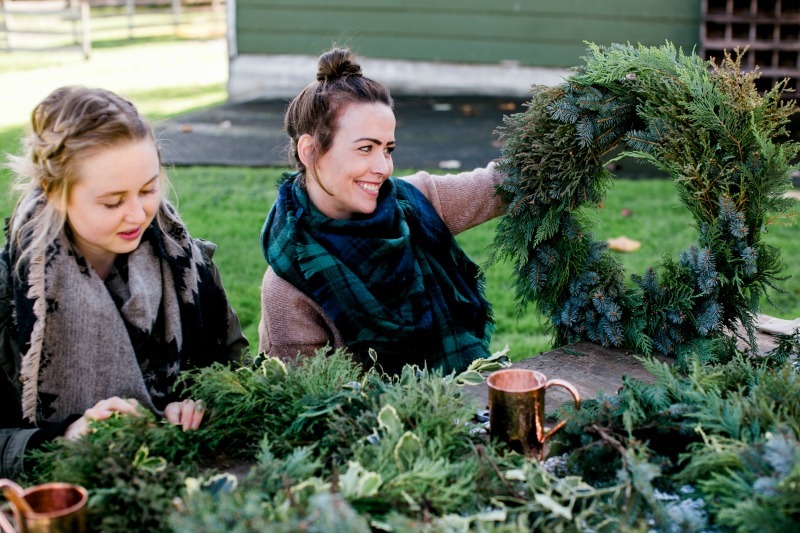 Now your wreath is starting to take shape! 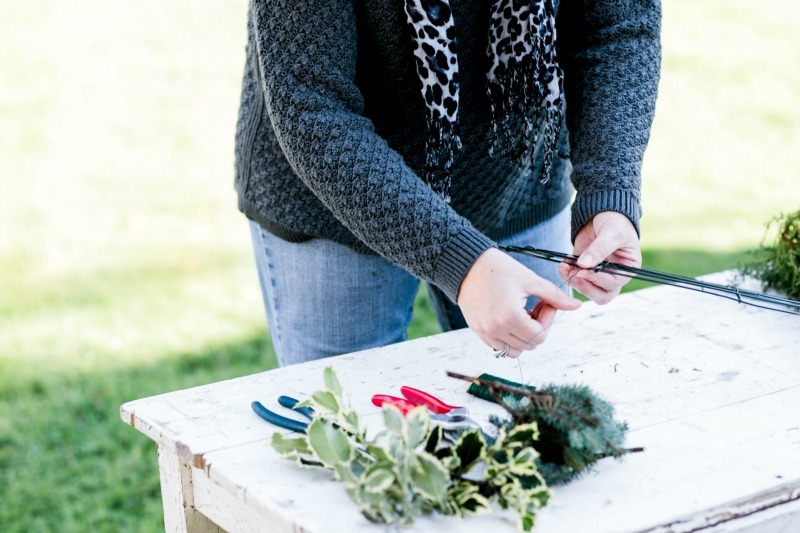 Keep up with the pattern of laying 3 stems across the frame and anchoring them with wire as you go. 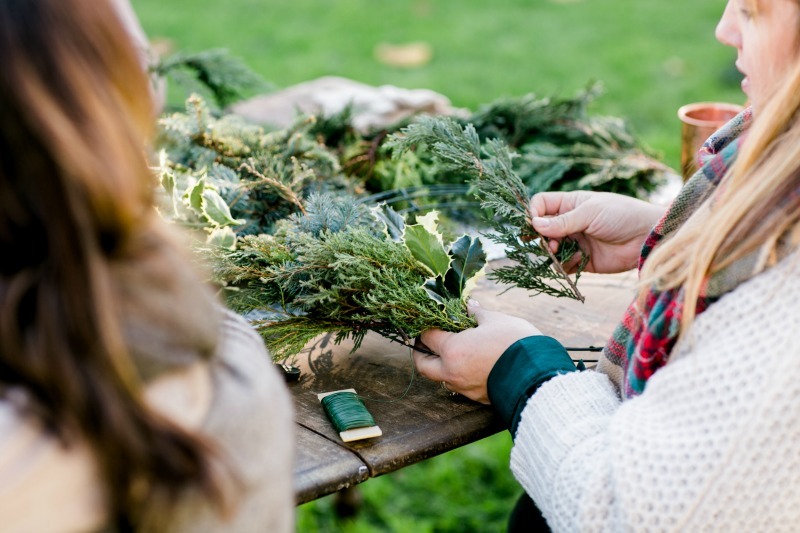 When you get back to the beginning of the wreath, tuck your last row of stems underneath the first row so their stems will be covered. It will be a bit awkward to hold the first row of stems up while you secure the last row, I know. But it is only one row you have to do this with. 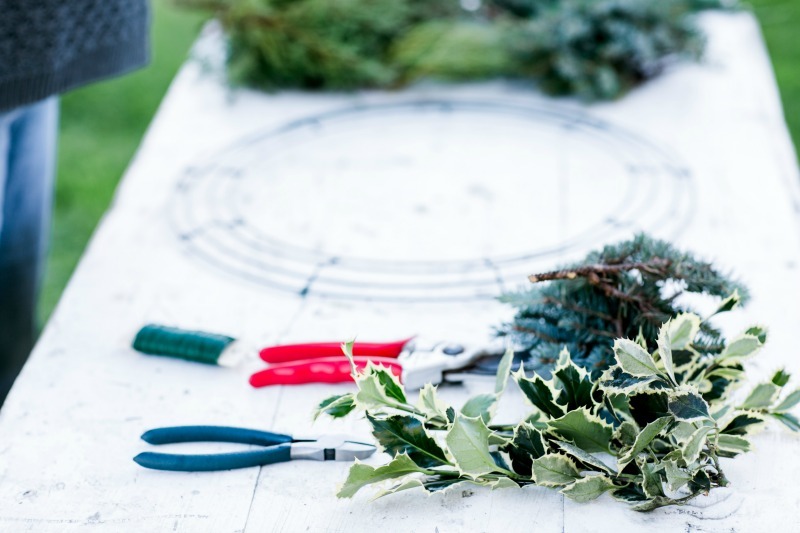 Once all the stems are on the wreath form and you are happy with the look, you can finish off the wire. Using your wire clippers, cut the wire about 1 inch from the frame. Wrap the wire around the frame until you reach the end. I want to thank Jenny Keller for inviting me to her Jenny Cookies Wreath Making Ladies Lunch. She is such a gracious hostess, opening her home to us for the afternoon. 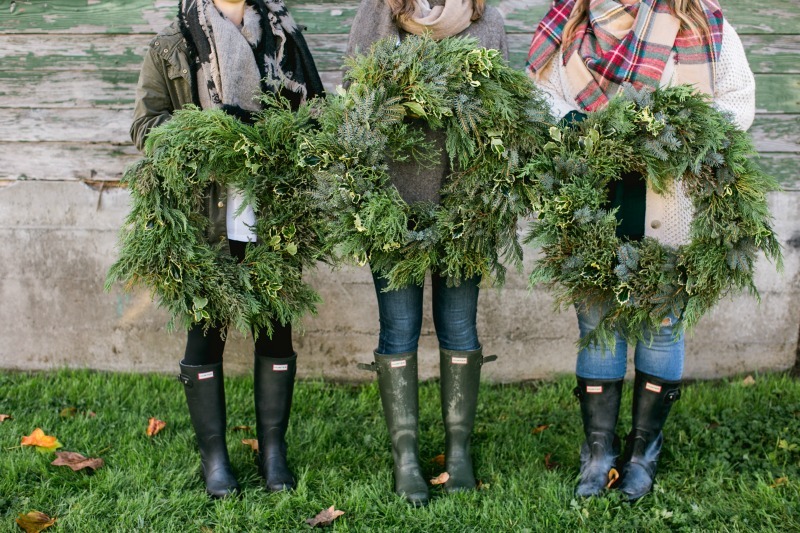 We had such a fun time making wreaths together!